I recently attended a VATE PD at my school as part of the “Best of both Worlds” project that connects primary and secondary schools within the area, in order to develop shared literacy practices. The PD was short and simple, targeting one key skill that teachers could apply within their classrooms. By focusing on one skill, it did not overwhelm teachers and make them feel pressured to apply everything they had learnt during the PD. The focus of this session was “Thick and Thin” questions- they can be referred to as “open and closed” questions, as well as “inferential and literal” questions. We were asked to define these two types of questions, after attempting some of our own. The next day I decided to use it with my Accelerated Year 9 class along with my team members who had also attended the PD. We used George Orwell’s 1984 as the passage to read aloud to the students. They were asked to write down “I wonder…” questions about the passage they were listening to. They weren’t told the name of the book or the author. Being an accelerated class, we had already worked with the students on previous occasions to develop their questioning skills. They wrote their questions in their Writer’s Notebook (as part of our usual fortnightly creative writing lesson). I let students know that I would take some photos their questions, expecting many to object. However many were eager to share their questions. Students were asked to share their questions with the class- everyone was eager to talk about the different questions they came up with. We collated the shared questions on the board and noticed the variety of questions. Some made links to President Snow (we studied The Hunger Games film in Term 1), whilst others wanted to know who had written it. The students will study Animal Farm next term, so they were interested to learn that the passage was from another of Orwell’s books. 1984 is not part of the curriculum, but we used it to see what links they could make. Many wondered if the book was based on the television show “Big Brother” and were surprised that it was the other way around. We went through the definition of “thick and thin” questions with them after this activity, encouraging them to look at what other questions they had asked. To extend the task, we then gave them instructions to choose a “thick” question that had been shared and write an answer to the question. The task was simple to run and worked well, given that the class are consistently taught critical thinking along with content and are encouraged to question “why” in all their subjects. I will run this activity with my mainstream/transition EAL students in Year 7, next term and teach them how to develop their questioning skills. It may not be an easy task, but with enough scaffolding, they too should be able to make links to the text they are studying and ask “I wonder” questions. 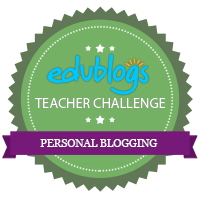 This entry was posted in 21st Century Learners, Learning, Professional Development, Teaching and tagged AITSL 2.5.